Print, fax, copy and scan from one versatile machine. Produce high-quality documents in black and color—this all-in-one delivers HP reliability and performance at an affordable cost. Get brilliant, true-to-life photos using optional 6-ink color. • Make the most of your time—print and copy at 30 ppm black and 24 ppm color. • Fax quickly in black and color—and easily block junk fax numbers. 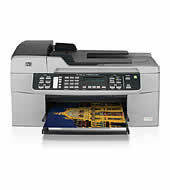 • Get high-quality scans with 2400 x 4800 dpi resolution and 48-bit color. • Make copies when you need them, using a convenient, one-touch button. • Count on the HP Officejet system for exceptional reliability, every time. • Rely on HP—PC Magazine rated HP service and reliability A/A+ for 15 consecutive years. • Protect your investment—HP Total Care offers extended warranties and services; call 1-866-234-1377. • Print, scan, copy and fax from one efficient machine that's small enough to fit on your desk. • Easily manage large documents—a 35-sheet automatic document feeder lets you focus time elsewhere. • Save time capturing text from hard copy documents with included HP software. • Monitor print jobs and get a low-ink alert on a 2-line text display. This page is part of GeneralManual.Com Network HP Officejet J5730/J5740/J5750/J5780/J5785/J5788 All-in-One Printer User Manual.